The quantified-self movement has a dark side: Once you start counting your steps or tracking your workouts, you might be surprised at the outrage you'll feel if something goes wrong and your device doesn't count a walk or run. I walked two miles once with my iPhone's GPS function turned off, which meant that RunKeeper recorded those 30-or-so minutes of activity but showed that I went zero miles. I was livid. All that exercise for nothing? The Magellan Echo watch will keep that from happening. 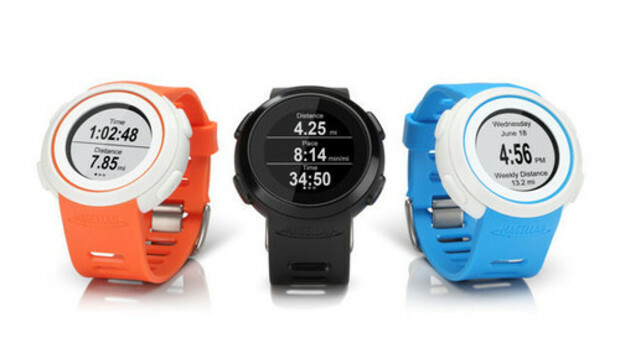 It doesn't do a lot: It's not a real GPS running watch that can track your runs on its own. It doesn't save any data to sync back to your phone. It's just a wearable Bluetooth display that provides real-time data about your run, while you're running. And it offers a couple of buttons for you to remotely control a supported running (or cycling) app while your phone stays in your pocket or armband or wherever you keep it while you're running (or cycling). So although the Echo is definitely helpful, its functions will likely be too limiting for most users to justify the $150 purchase. Since the Echo connects to your phone over Bluetooth LE, it's compatible only with recent iPhones (4s and newer), the fifth-gen iPod touch, and some recent iPads ... in case you take your iPad running or cycling with you, perhaps? (Hey, I don't know your life.) It doesn't work with Android phones just yet, but since KitKat supports Bluetooth LE, that should come later. The nice thing about Bluetooth LE is that it doesn't use a lot of power, so you won't have to charge the Echo as you would a GPS running watch. The Echo runs on a regular coin-cell battery; Magellan estimates that the battery will last about six months. One small drawback: You don't pair a Bluetooth LE device to your iPhone by going to the old, standard Settings > Bluetooth menu. Instead, you have to find the pairing command inside of each compatible app's settings. To have the Echo search for a compatible app running nearby, first press the bottom-right button on the Echo; when the screen shows that an application has been found, you press that button again to confirm the pairing. The fact that the pairing process differs slightly from app to app isn't a huge deal. The bigger problem is the relative paucity of Echo-compatible apps, at least right now. You can use the Echo with iSmoothRun, Map My Run, Strava Cycling, Strava Run, and Wahoo Fitness. My standby, RunKeeper, isn't on that list, but luckily iSmoothRun can upload to RunKeeper. Other developers could add Echo compatibility to their fitness apps in the future--but let's not count those chickens before they hatch. Once you've paired the Echo and your running app, you can start a new workout, and the Echo shows you data while you run. The exact data it shows depends on the app--the Echo is merely a wireless display for whatever information your app decides to share. At the bare minimum, you'll see the elapsed time and the distance you've run; some apps also show your pace. So instead of craning your neck to read an iPhone display strapped to your arm, or digging into your pocket to pull out your iPhone, or listening for the periodic audio cues that pretty much every running app is equipped to provide, you can just look at your wrist. But ... if hearing audio cues or looking at your phone directly are enough for you to stay informed, you really don't need the Echo. The Echo has four buttons, which you can use, depending on your running app, to pause workouts or switch music tracks. In Strava, for example, as long as you're playing something stored on your phone (not from a streaming service), and you queue up your workout music inside the Strava app, you can use the top-right button to play/pause the tunes, and use the bottom-right button to record/pause your workout. (In case you stop to fix a broken shoelace, say, or buy a doughnut--no judgments here.) So that's handy too, but again, you could pause your workout on your phone, and control your music either on the phone or with the little inline remote that's (probably) on your headphones. Once your workout is over, the Echo goes back to being a watch. It's not particularly attractive, nor is it hideously ugly. The Magellan Echo Utility lets you customize the basic display a bit by selecting the watch face and date style. It also shows your weekly average for the runs you took with it, which is a nice touch but nothing more. The Echo works just fine at everything it tries to do. The problem is, who is it for? Serious athletes would probably prefer a real GPS watch with more features that don't rely on a phone. And casual runners probably don't care enough about seeing real-time run data on their wrists to shell out $150. The Pebble is $150, for example, and it has a RunKeeper app--as well as a ton of other features. The Echo feels as if it's trying to solve a problem that no one has.